Choosing the right garden shed from the plethora of garden centres around the country as well as the 100s of retailers online can be quite overwhelming. With each company offering garden sheds of various styles, qualities, thicknesses, and heights, it can be quite difficult to decide the best one for you, just by looking at a picture. Even in a garden centre, where you can actually see and touch the product, it is barely the etiquette to hit, kick or push the shed, just to see how strong the product actually is. For this reason, Tiger Sheds are developing a series of videos to show you just how strong their shed actually is. The most recent, The Football Test, investigates the strength and durability of two sheds, one from Tiger Sheds and one equivalent style shed from an unnamed competitor. Here, footballs are booted at both sheds to see if either can withstand the force of a football, even with ex-premiership and international footballers getting involved! All football fans will surely remember Lee Sharpe – an electric, precocious teenager who earned a headline making move to the Manchester United first team making most of England sit up and pay attention. Fearless performances on the left wing brought Sharpe a PFA Young Player of the Year award, 8 caps for England, and many league and cup winners’ medals for Manchester United. Sharpe may now be 37 but he still retains his youthful exuberance and enthusiasm for life. And whilst he still has his other interests such as the Lee Sharpe Foundation Charity, he still relishes the chance to lace up his boots and kick a football. In this Tiger Sheds football test, with help from his good friend Greg Thompson (ex-Manchester City), he is doing just that. Lee Sharpe is kindly donating his entire fee to his Lee Sharpe Foundation, which helps establish football academies for disadvantaged children in Africa. Their aim is to improve the well-being of children by providing opportunities and facilitate the rehabilitation and reintegration of children affected by poverty, war and natural disasters. He also shares our view the necessity to have a good quality product in your garden, for storage and safety, particularly when young children in the garden are kicking footballs around. But why is strength so important in a garden shed? A garden shed, storing personal valuable garden equipment and tools, needs to be strong enough not only to deter anyone from trying to break in, but to withstand its greatest foe, the weather. In England particularly, the recent winters being the greatest example, garden sheds are snowed on, rained on, and blown in the wind all year round. Timber being natural obviously expands in these wet conditions and then shrinks in the dryer warmer summers. Because of the movement in timber and due to the constant pressures they are put under, it is generally the case with many garden sheds that eventually you will see the floor falling through, and the roof sagging in the centre. It is for these reasons that strength and durability is essential to extend the life of your garden shed. But again, by simply looking at a shed, or seeing one online, it is near impossible to see just how strong and durable it is. 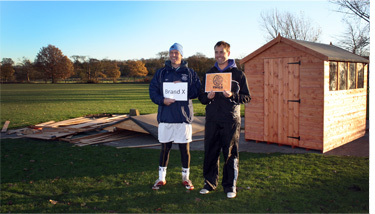 As you can see from the video, the clear winner of the test is the Tiger Shed. Despite the battering of footballs into the shed, from all angles, it was left with barely a scratch. The reason Tiger Sheds are so strong is due to the manufacturing process and the materials used, which are quite different to many other sheds you will find elsewhere online and in your local garden centre. Tiger Sheds are comprised of thicker cladding (at 12mm thick) and more importantly thicker framework (at 44x28mm). The framework is rounded four corner framework unlike most competitors who used rough cut framing which is more prone to warping and splitting. Tiger Sheds have fully boarded tongue and groove roof and floors whereas most other companies use cheaper OSB or chipboard. Despite claiming football isn’t his main interest these days, Sharpe is still very clued up on the game, as you’d expect from a former professional. But for this former Premier League star, it’s clear nothing quite beats lacing up your boots and getting stuck in on the pitch. Both Thompson and Sharpe gave it their best shot when trying to knock the Tiger Shed down, but they just couldn’t do it.